The Seahawks Gdynia are an American football team that plays in the Polish American Football League. Based in Gdynia, Poland and named after the Seattle Seahawks, the team pays homage to the fact that Seattle and Gdynia have been sister cities since 1993. In 2011 the Seahawks Gdynia celebrated their first equivalent of Super Bowl trophy, commonly known as the Polish Bowl. The football, signed by Michael Bennett and donated by the Seattle Seahawks organization, traveled from Seattle to Gdynia on May 24th 2014. After arriving on the beautiful northern coast of Poland, our member, Mateusz Kubas contacted the Seahawks Gdynia to setup a meeting in order to officially present the football and establish a relationship. 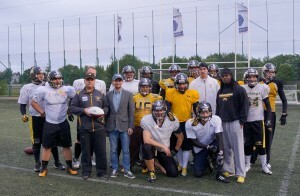 The presentation took place on a Tuesday evening at the Polish National Rugby Stadium, which the Seahawks Gdynia call their home. 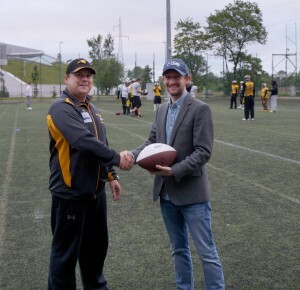 Shortly before the training commenced, the ball was handed over to Head Coach Maciej Cetnerowski on behalf of the Seattle Seahawks and the Seattle-Gdynia Sister City Association. After a short speech and few hand-shakes, commemorative photos were taken.